Forestry Corporation NSW will be applying herbicide to recently harvested areas on State Forest in a few areas adjacent the Hume and Hovell Track during April. The timing of works will be weather dependent and will be applied via ground or helicopter application. Operations will occur during April and May 2019. Please see the map below for further details of the location and Forestry Corporation information sheet located here. Five bridges earmarked for replacement this (financial) year will shortly be removed from the Hume and Hovell Track. These bridges pose significant risk to the user and it will be safer to cross the creeks and gullies without them. There is little or no water in these waterways at present. Please proceed with caution and use care when crossing these creeks and gullies. The first bridge across Miller’s creek when heading south from Log Bridge Creek campsite. This creek currently has a small amount of water in it. The bridge across Pompey Pillar Creek. This creek currently has a small amount of water in it. Thank you for your understanding while we undertake important Hume and Hovell Track maintenance and infrastructure replacement. More news to follow on this program of infrastructure replacement…. 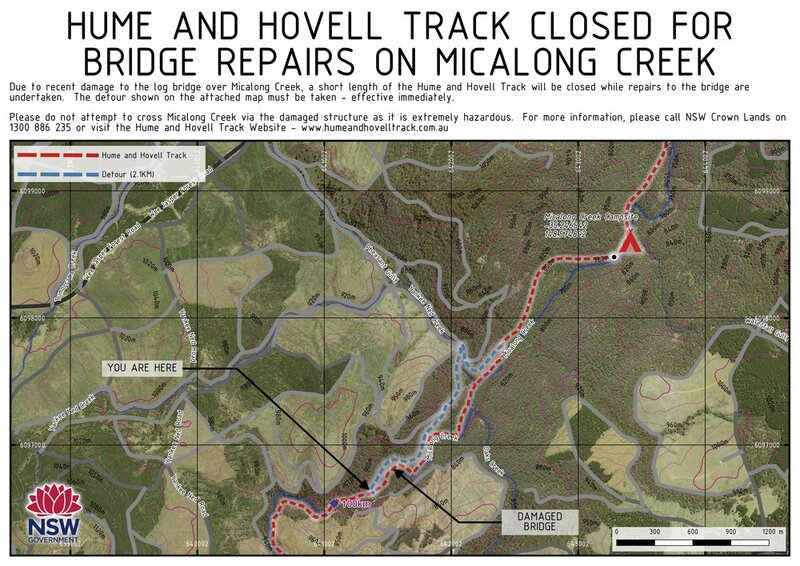 With the recent very hot weather, please be aware the Hume and Hovell Track is CLOSED on days of total fire ban. Always check the current bush fire rating at NSW Rural Fire Service: https://www.rfs.nsw.gov.au/fire-information/fdr-and-tobans or by phoning 1800 679 737. The RFS map is based on Council Boundaries. Please see the map of the Hume and Hovell Track with the Council Boundaries overlaid so you know which Council region your intended walk falls in. Always check weather forecasts and conditions prior to your trip. Don’t plan to go anywhere remote in periods of extreme weather. This is for your safety, and the safety of emergency services personnel. Stay safe out there! Following one of our regular track audits, some significant damage to a log bridge over the Micalong Creek was discovered. The bridge is located in between Micalong Ck Campsite and Bossawa Campsite and is approximately 5km north of Brindabella Rd. For the safety of track users, a detour around the bridge has been put in place effective immediately. The detour uses a section of forestry road on the northern side of the creek but does require the traverse of the creek at an existing ford. Please do not attempt to cross Micalong Creek via the damaged structure as it is extremely hazardous. For more information, please call NSW Crown Lands on 1300 886 235 or contact the Track Manager. The bridge has been included in the 2019 capital works program and is expected to be replaced before June 30, 2019. The Wee Jasper detour is officially over for winter! The Hume and Hovell Track is open once more heading south from Fitzpatrick Trackhead. 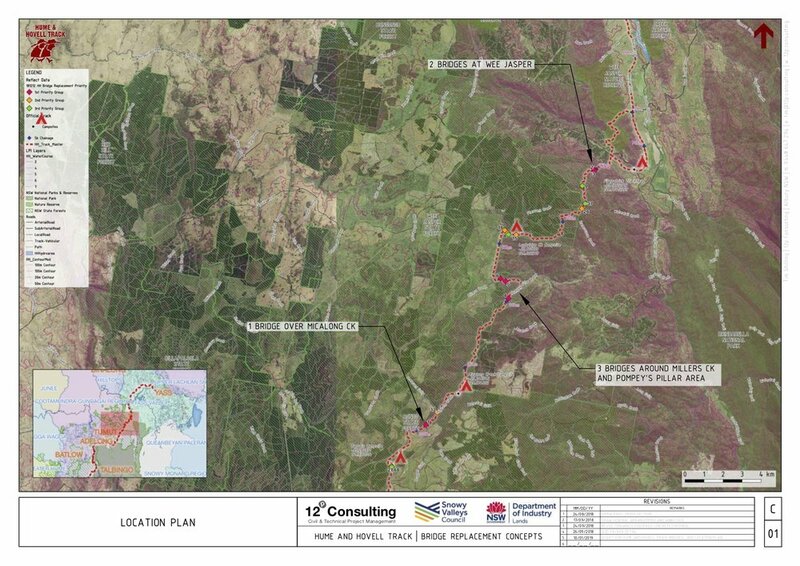 Forestry operations will recommence in summer and a detour will be in place again. 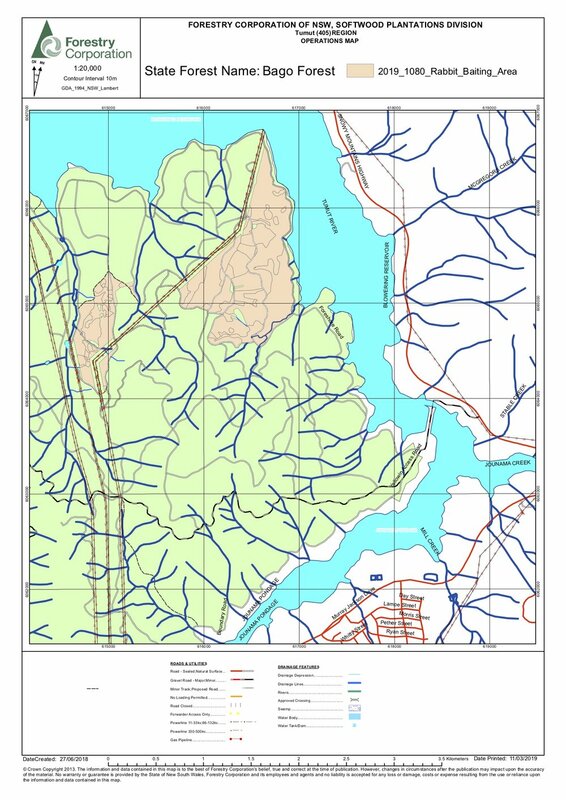 Due to forestry harvesting operations around Blowering Reservoir, a short detour will be in place north of MacDonald's Rd on the Blowering foreshore. The detour shown in blue will be in place for approximately 3 months from early February through to April. Please keep to the detour during this period. 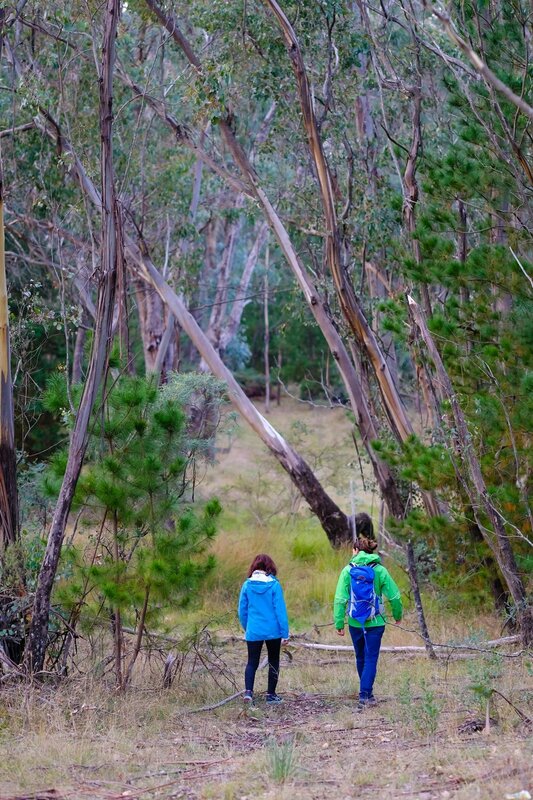 Forestry operations will be taking place along a 2.4km section of the Hume and Hovell Track at Mundaroo approximately 5.5km south of Mannus Campsite. The harvesting operations will commence in early February and will continue through to the end of March, 2018. While the track in this area will not be closed, during this time, please follow the directions of forestry personnel where any work zones are encountered. or by phoning 1800 679 737.